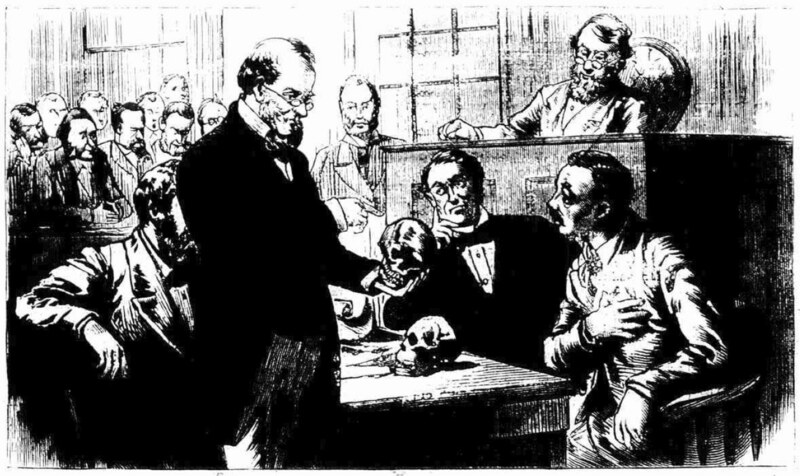 Murder by Gaslight: The Guttenberg Murder. 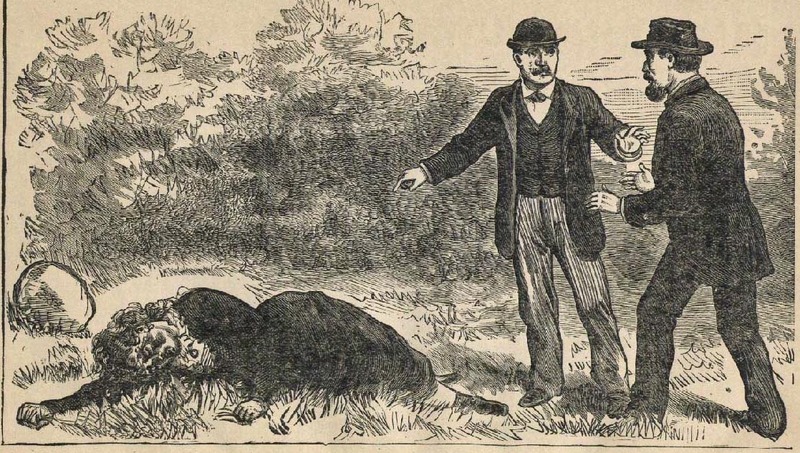 On May 13, 1881, a man gathering leaves in the woods outside of Guttenberg, New Jersey, nearly stepped on the body of young woman lying dead on the ground. He hurried away to inform the police. That afternoon the coroner of Hoboken visited the spot and made an examination of the body. She had been an attractive woman with small and symmetrical features; he judged her to be around twenty-five years old. Along the top of her head, on the left side, was a deep gash and beneath it the skull was fractured. There was another gash over the right eye. Both wounds had apparently been made with the edge of a heavy stone. Her nose was broken and her left ear had been injured as if an earring had been torn from it. She remained unidentified for five days, then a New York City tobacconist named Simon Muller came to see if it was his missing wife, Mena (short for Philomena). He was accompanied by his wife’s sister Maria Schmidt. In spite of the condition of her face, both positively identified her as Mena Muller, and recognized her clothing and jewelry as well. Mena and her husband had been separated for some time, and two weeks earlier she had told her sister that she had found a decent man from Alsace, who was going to marry her and take her to Europe aboard the steamer L’Amerique, to set sail on May 4. Miss Schmidt told this to Simon Muller who went to the docks on May 4 and watched the gangplank as the passengers boarded the ship. His wife was not among them. This story confirmed some information that the police already had. 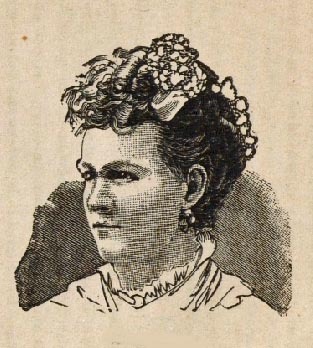 Mrs. Frinck, the wife of an alehouse keeper in New York, was suspicious of a couple in the saloon on May 3. The woman seemed to have plenty of money and she talked incessantly. Before she left she borrowed a corkscrew to open a bottle of Rhine wine that she had purchased in Hoboken. The description Mrs. Frinck gave of the woman tallied exactly with the description of the murdered woman so police detectives set out to trace the couple’s movements. They found that the wine had been purchased at an inn run by Edward Stabel. The woman who bought it had told him that she and her husband had just been married by the Reverend Dr. Mabon, at the Grove Reformed Dutch Church and she wanted to celebrate the event and treat the minister. The man had waited outside and Stabel did not get a good look at him, but his description of the woman matched that given by Mrs. Frinck. The detectives spoke with Dr. Mabon, who remembered performing the ceremony. They identified themselves as Louis Kettler and Mena Schmidt, and gave an address on Third Street in New York, but Mabon could not recall anything specific about the couple. His servant, however, remembered that the man had a full face and a dark mustache. Before the service he paced back and forth in the garden as if his mind was troubled. The detectives went next to the Third Street address. No one there knew Mena Schmidt, but they found an expressman who had moved four trunks for a Mena Muller, from Third Street to Scherrer’s Hotel on Christopher Street. There they were told that Mr. and Mrs. Kettler had checked in on May 2. They went out the morning of May 3, but late that night Mr. Kettler had returned alone. He said his wife had stayed at her sister’s house and they were to meet on the steamship the next day. The next day he had his trunks delivered to the steamship wharf and checked out. With Louis Kettler aboard a ship heading to Europe, New Jersey Attorney General Stockton sent a message to authorities at Havre, describing Kettler and requesting his arrest on the charge of murder. Two Hoboken detectives were preparing to set sail for Europe. But a Jersey City reporter named Gustavus Seide, did not believe that Kettler had left on L’Amerique. There was no certainty that the baggage had actually been delivered to the wharf, and there was no positive evidence that Louis Kettler had actually boarded the ship. With some difficulty Siede located C. A. Strang, the expressman who picked up the baggage at Scherrer’s Hotel. Strang told him that he had not delivered the trunks to the wharf, but to an address on Charles Street. Then about ten days later he moved three of them to an address on Thirty-sixth Street. At the Charles Street address, Siede was told that Kettler had left for California, leaving behind a trunk full of crockery and cookware. Siede and Strang took the trunk to Thirty-sixth Street, where no one knew Louis Kettler, but a man fitting his description, named Martin Kinkowski lived there with his wife and two children. Kinkowski was not home, but his wife recognized the trunk and paid Srang fifty cents to carry it into the house. As Gustavus Siede and C.A. Strang stood outside watching the house and waiting for Kinkowski’s return, they were arrested by a Hoboken policeman. Following their own line of inquiry, the police had come to Thirty-sixth Street looking for the same man. They had mistaken Siede for Kinkowski. The matter was straightened out at the police station and the officers were sent back to Thirty-sixth Street. That night, Martin Kinkowski, alias Louis Kettler, was arrested for the murder of Philomena Muller. Keeping the prisoner alive was the chief concern that night. News that they had captured the Guttenberg killer traveled fast and a crowd over 400 people stood on Thirty-sixth street, calling to lynch Kinkowski. They got him safely to the Hoboken ferry, but another crowd seeking vengeance was waiting on the Jersey side. When Kinkowski was safely in his jail cell he had to be kept under surveillance—he was so despondent that the jailers feared suicide. Kinkowski denied any connection to Mena Muller’s murder. He admitted that he knew her and said that they had been together at Scheutzen Park in New Jersey on May 3. They stopped in a saloon for some beer and when they came out they saw two men walking down the road. One of them said “Hello, Mena! What are you doing over here?” When Kinkowski heard this he turned to Mena and said, “If you are that kind of a woman, I’ll have nothing to do with you.” He left her with the two men and never saw her again. 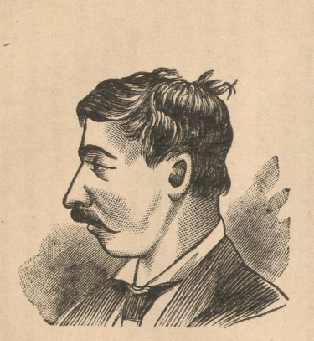 The trial of Martin Kinkowski for the murder of Philomena Muller was held in the Hudson County Court of Oyer and Terminer, prosecuted by Attorney General Stockton. The evidence against Kinkowski was entirely circumstantial but it was compelling. The prosecution presented a parade of witnesses who testified to seeing Martin Kinkowski and Mena Muller together at various times on May 3, and to the movement of his trunks after the murder. At one point the courtroom was shocked when a medical examiner produced Mena Muller’s skull to illustrate the wounds she received, but there was no physical evidence to link Kinkowski to the wounds. Kinkowski’s defense was little more than his testimony contradicting or explaining away the testimony against him. He held to the story of the two men who she left with that day and wanted to take the court to the spot where it happened. This was disallowed by the judge. Kinkowski said he had not taken the trunks to Charles Street to conceal them, but to hold them for Mena’s return. Throughout the trial Kinkowski was emotionally charged. In his closing argument, when the Attorney General declared Kinkowski to be the murderer, he jumped to his feet shouting that God knows he is innocent and will protect him. He was not protected from the jury, who after an hour of deliberation found Kinkowski guilty. When the verdict was read Kinkowski fainted. Martin Kinkowski was hanged inside the Hudson County Jail in Jersey City on January 6, 1882. He made no confession; professing his innocence to the end. Wedded and murdered within an hour! Philadelphia: Barclay & Co., 1881. "Kinkowski Found Guilty Of Murder." New York Tribune 22 Oct 1881. "Kinkowski Led to the Gallows." 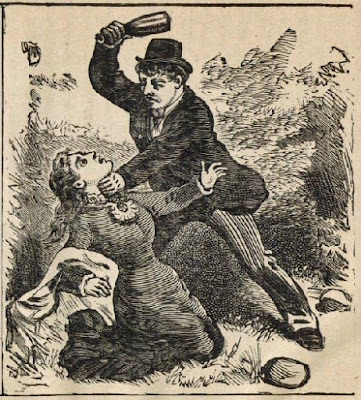 The National Police Gazette 21 Jan 1882. 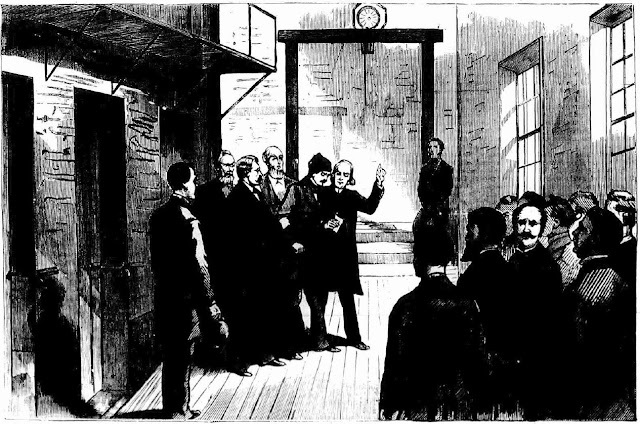 "Kinkowski Sentenced to Death." New York Herald 6 Nov 1881. "Kinkowski's Confession." New York Herald 15 Dec 1881. "Kinkowski's Defence." New York Herald 15 Oct 1881. "Kinkowski's Defense Begging to be Allowed to Visit the Place Where He Last Saw Mina Muller." 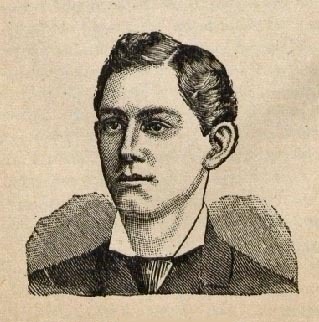 Cincinnati Commercial Tribune 19 Oct 1881. "Kinkowski's Farewell." New York Herald 2 Jan 1882. "Kinkowski's Fate." New York Herald 4 Dec 1881. "Martin Kinkowskis Trial Damaging Testimony Against Kinkowski Identified by a Lady." New York Herald 8 Oct 1881. "Mena Muller's Murder." New York Herald 6 Oct 1881. "Nearing the Gallows." New York Herald 4 Jan 1882. "Paying The Death Penalty." New York Tribune 7 Jan 1882. "The Guttenberg Murder." New York Tribune 6 Oct 1881. "The Weehawken Murder." National Police Gazette 22 Oct 1881.